Photo Credit: Courtesy of KCET. Judging from the storylines of Agatha Raisin, Father Brown and Death in Paradise, seemingly quiet places one should never go if you love living would be the fictional villages of Carsley and Kembleford in the Cotswolds or the picturesque fictional Caribbean island of Saint Marie. Based on the best-selling novels of M.C. 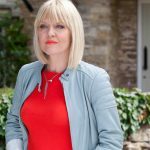 Beaton, Agatha Raisin stars Ashley Jensen who packed up her London PR firm to create a ‘quiet’ new life for herself in the Cotswolds. Unfortunately, the ‘quiet’ part or her early retirement lasted about as long as it takes to buy a quiche and enter it into the local competition before her new career as an amateur sleuth was born. 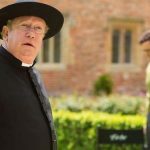 Series two, which returns to Acorn TV in November 2018, will adapt three of MC Beaton’s novels, The Wizard of Evesham, The Curious Curate and The Fairies of Fryham and will be available internationally as three 90-minute mini-movies giving the plots of the original books more time to flesh out the mysteries and maybe throw in a few red herrings as well. While we know that Matthew Horne (Roy Silver), Katy Wix (Gemma Simpson) and Matt McCooey (DC Bill Wong) will be returning for series 2, the unknown factor at this point is whether or not Jamie Glover will return as Agatha’s love interest, James Lacey. 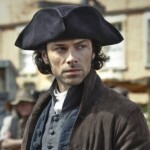 Word is, Agatha might have a new suitor in Season 2, and it’s someone viewers met in Season 1! Agatha Raisin fans may remember that the last episode of the first season, Agatha and James almost married in the episode called “Agatha Raisin and the Murderous Marriage.” James got cold feet when Agatha’s husband was murdered. He took off for Cyprus and the season ended with Agatha going after him. 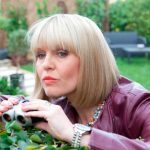 Agatha Raisin S2 returns to Acorn TV in November 2018! 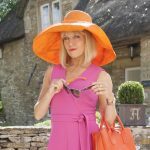 Get to know Agatha Raisin author, M.C. Beaton! i would love to see the vintage doctors on there i love all the older doctor who series from willaim hartwell to colin baker. but i guess i am the only one to request it.